Headquartered in the incomparable city of Ann Arbor, Michigan – right down the road from one of the country’s leading public universities – ProQuest develops many of the best-known products for academic, public, corporate and government libraries. It’s an important job, so the company does everything can to make it rewarding for employees. 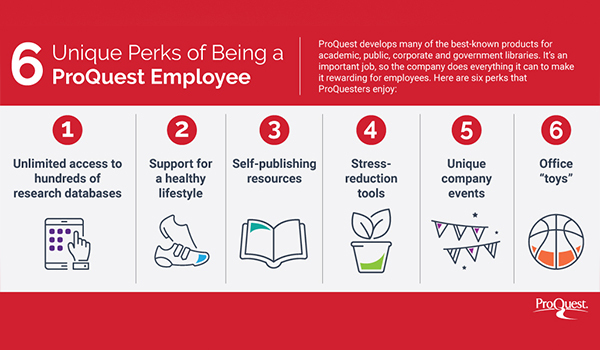 Here are six perks that ProQuest employees around the world enjoy. Unlimited access to hundreds of research databases, like Ancestry.com — ProQuesters have free access to a wealth of resources that most people can only get through their library. This includes the popular Ancestry.com, HeritageQuest, ProQuest Central, Ebook Central, Newspapers.com, CultureGrams and many others. Colleagues can also retrieve this content at home, which comes in especially handy for anyone with a school-aged child who waits until the last minute to write a paper. Support for a healthy lifestyle — ProQuest’s U.S. employee wellness program, Vitality, handsomely rewards anyone who makes healthy lifestyle choices. Walk, run, purchase nutritious food, quit smoking or go to the dentist for a checkup – and you’ll get gift cards and enjoy discounts on your healthcare plan. Some ProQuest offices have on-site fitness centers, free healthy snacks for their employees and Bevi flavored water coolers (to counteract the also-free Starbucks coffee). Ride your bike to work? Use the bike repair station to fix flat tires or tune up before the commute home. Self-publishing resources — What else would you expect from a company full of bibliophiles? ProQuest employees who dream of writing the next bestseller in their spare time can get free ISBNs and other self-publishing tools from Bowker. Stress-reduction tools — We all have rough days. If you’re in the middle of one at ProQuest, you can take a few moments to relax and decompress with on-site yoga classes, chair massages or outdoor hammocks before getting back to work. Or get in your steps during work hours by walking for an hour on the treadmill desk. Unique company events — Like many companies, ProQuest offices host summer picnics and holiday parties, but they also go big for Diwali, Halloween, Star Wars Day (May 4th), Take Your Kids to Work Day and Mardi Gras. Office “toys” – A basketball hoop, ping-pong tables and remote-control speedboats — yes, really — give colleagues a great excuse to take a 10-minute, mind-clearing break. Speedboats aside, what’s it like to work at ProQuest? Learn more about the company, its culture and its employees.